The Punk Rock Holocaust series is a unique mix of a horror/comedy movie combined with live concert performances shot on the Vans Warped Tour. The plot of the first film follows Warped Tour founder Kevin Lyman as he tries to maintain the 2003 tour amidst a string of gristly murders at the hands of a pop-punk ‘Executioner’ while keeping the evil record executive Belial (Played by Troma Entertainment’s Lloyd Kaufman) at bay. Meanwhile, tour reporter Heather Vantress is trying to figure out who is behind the heinous crimes as the Warped Tour crew and bands (all played by themselves) are struggling to survive and stay on the road. The original Punk Rock Holocaust features what has been called the highest on-screen body count in slasher film history with entire crowds being massacred in addition to the deaths of over 110 band members including (In alphabetical order) Atmosphere, Andrew WK, Beret, Big D and the Kids Table, Bowling For Soup, Destruction Made Simple, Dropkick Murphies, Face To Face, Glassjaw, Horrorpops, The Kids Of Widney High, Less Than Jake, Me First and the Gimmie Gimmies, MEST,Never Heard Of It, Pennywise, The Phenomenauts, Rancid, Simple Plan, Suicide Machines, Treephort, Tsunami Bomb, The Used, Vendetta Red and more! 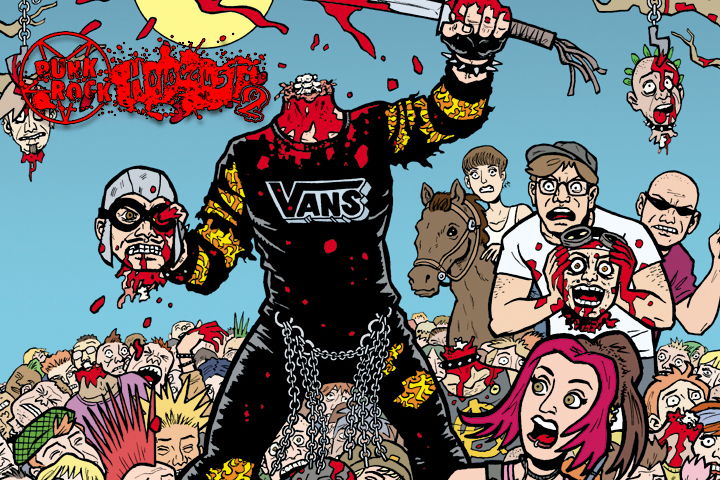 Set one year after the original movie, the sequel finds the demonic Executioner’s headless, undead corpse back on the 2004 Vans Warped Tour looking for its head! The killer’s body is tearing the heads off of various band members and sticking them on the jagged spinal cord where his neck used to be, using them to look for his own head. The heads retain the personality of the band member but the body is pure evil and is still carrying out the killings. The estranged heads aren’t on too good and keep falling off. On the tour there is total “Holocaust Denial” as Kevin Lyman and his tour production staff refutes the reports of carnage that happened in the previous year. Meanwhile, the evil Record Executive Belial (once again played by Troma’s Lloyd Kaufman) is on the rampage and on Lyman’s case about the deaths on the tour. One precocious, nubile “Holocaust Survivor” named Meghan has become a reporter for a small independent magazine. She is determined to get to the bottom of the story and reveal the truth to the world. Kevin Lyman is hiding something, but why? And what? 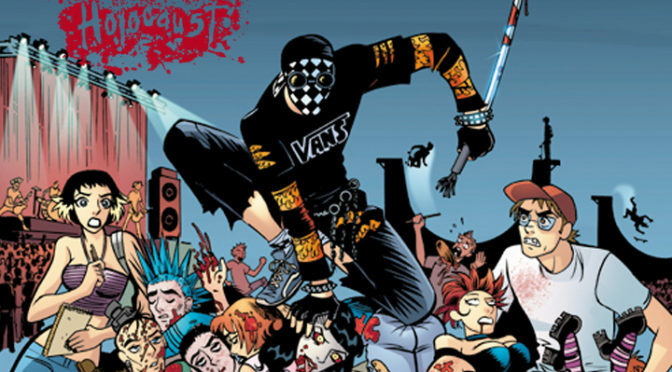 The film features live music performances as well as acting performances from some of the top bands of the 2004 and 2005 Warped Tours including The Aquabats, Bouncing Souls, The Casualties, My Chemical Romance, River City Rebels, Riverboat Gamblers, The Planet Smashers, Mr. Dibbs, Teenage Harlets, Shira Girl, Pro BMX Rider Rick Thorne and more! Previous PostBehind the scenes on Punk Rock Holocaust 3!Next PostPunk Rock Holocaust on the Final Vans Warped Tour! !